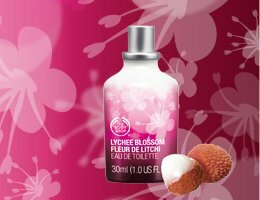 The Body Shop has launched Lychee Blossom / Fleur de Litchi, a new "fresh and energizing" limited edition fragrance for women. The notes include lychee, guava, mangosteen, magnolia, lychee blossom, freesia, sandalwood and white musk. The Body Shop Lychee Blossom is available in 30 ml Eau de Toilette or 100 ml Body Mist, and in matching body products. Fleur de Litchi —-which of course I keep seeing as l’itchy….and that makes me….well…Itchy. LOL —you’ve got a point—-I’m usually “itching” to buy something, that’s for sure! unfortunately for them: I’m more itching to buy Penhaligon’s Night Orange Blossom than anything right now. The Itchy one is cheaper. Oh yummy Daisy, I’m lychee to buy the same thing! So, fresh = watery and energizing = sugar-loaded? I have a feeling my 5 yr old would love this. I dunno about that Boo…..your 5 yr old has pretty refined tastes ….she might reject this in favor of something way more spendy—reminds me of my own spendy-tastes child. She loves guava and lychee though…although in drinkable form. But you’re probably right. I was wondering aloud which perfume to wear the other day, and she piped up “I really liked the licorice one” (Etro Anice). Long memory on that kid! I’m horribly jealous. It does sound really sweet…which is why I rarely like litchi in perfume. Doesn’t it though? It almost sounds like a tropical drink. Just add rum. OMG, I love lychees (and I always pronounce it in my head as “lizhi”, like they do in Chinese because it is the only time I get to be super pretentious), but I know I will loathe this. I haz a sad.